Common practice to remove flashing and sand wooden parts is by hand. 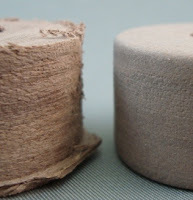 Sandpaper or sanding wheels can be used to effectively clean up parts one at a time. A more efficient process (especially for large quantities of parts) is to use barrel tumbling. This picture shows a before (left) and after (right) of a walnut wood part with heavy flashing, excess material on the edges and a rough cut surface finish. This is probably an extreme example; however, a simple barrel tumbling process created the surface finish on the right. This part was tumbled with Hardwood Media and a small amount of 120 Mesh White Aluminum Oxide overnight. The result is a smooth surface finish with rounded edges and no excess material.